The fight for a higher minimum wage has become the biggest national labor story in decades. 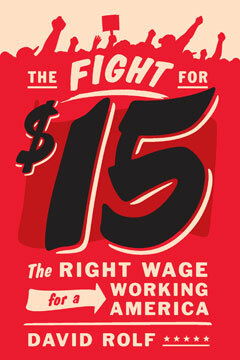 Beginning in November 2012, strikes by fast food workers spread across the country, landing in Seattle in May 2013. Within a year, Seattle had adopted a $15 minimum wage—the highest in the United States—without a bloody political battle. Combining history, economics, and commonsense political wisdom, The Fight for Fifteen makes a deeply informed case for a national $15/hour minimum wage as the only practical solution to reversing America’s decades-long slide toward becoming a low-wage nation. Drawing both on new scholarship and on his extensive practical experiences organizing workers and grappling with inequality across the United States, David Rolf, president of SEIU 775—which waged the successful Seattle campaign—offers an accessible explanation of “middle out” economics, an emerging popular economic theory that suggests that the origins of prosperity in capitalist economies lie with workers and consumers, not investors and employers. A blueprint for a different and hopeful American future, The Fight for Fifteen offers concrete tools, ideas, and inspiration for anyone interested in real change in our lifetimes.